Astronomers have gotten their deepest glimpse into the heart of our Milky Way Galaxy, peering closer to the supermassive black hole at the Galaxy's core then ever before. Using the National Science Foundation's continent-wide Very Long Baseline Array (VLBA), they found that a radio-wave-emitting object at the Galaxy's center would nearly fit between the Earth and the Sun. This is half the size measured in any previous observation. "We're getting tantalizingly close to being able to see an unmistakable signature that would provide the first concrete proof of a supermassive black hole at a galaxy's center," said Zhi-Qiang Shen, of the Shanghai Astronomical Observatory and the Chinese Academy of Sciences. A black hole is a concentration of mass so dense that not even light can escape its powerful gravitational pull. as seen with the VLA. 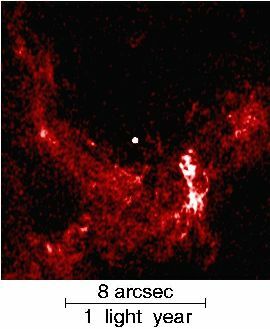 The astronomers used the VLBA to measure the size of an object called Sagittarius A* (pronounced "A-star") that marks the exact center of our Galaxy. Last year, a different team announced that their measurements showed the object would fit inside the complete circle of Earth's orbit around the Sun. Shen and his team, by observing at a higher radio frequency, measured Sagittarius A* as half that size. A mass equal to four million Suns is known to lie within Sagittarius A*, and the new measurement makes the case for a black hole even more compelling than it was previously. Scientists simply don't know of any long-lasting object other than a black hole that could contain this much mass in such a small area. However, they would like to see even stronger proof of a black hole. "The extremely strong gravitational pull of a black hole has several effects that would produce a distinctive 'shadow' that we think we could see if we can image details about half as small as those in our latest images," said Fred K.Y. Lo, Director of the National Radio Astronomy Observatory and another member of the research team. "Seeing that shadow would be the final proof that a supermassive black hole is at the center of our Galaxy," Lo added. Many galaxies are believed to have supermassive black holes at their centers, and many of these are much more massive than the Milky Way's black hole. The Milky Way's central black hole is much less active than that of many other galaxies, presumably because it has less nearby material to "eat." 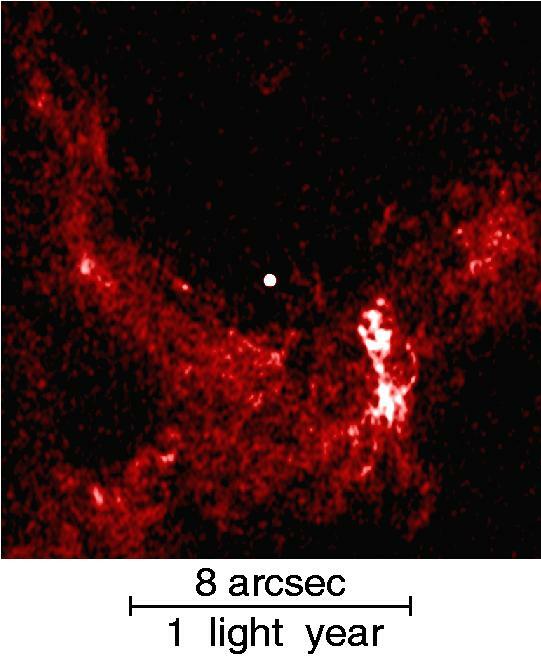 Astronomers believe that the radio waves they see coming from Sagittarius A* are either generated by particle jets that have been detected in many more-active galaxies or from accretion flows that are spiraling into the central black hole. By observing the object at higher radio frequencies, scientists have detected a region of radiation ever closer to the black hole. The results announced last year were based on observations at 43 GigaHertz (GHz), and the latest observations were made at 86 GHz. "We believe that if we can double the frequency again, we will see the black-hole shadow produced by effects of Einstein's General Relativity theory," Lo said. In a few years, when the Atacama Large Millimeter Array (ALMA) comes on line, it may be used in conjunction with other millimeter-wave telescopes to make the higher-frequency observations that will reveal the telltale black-hole shadow. At a distance of 26,000 light-years, the Milky Way's central black hole is the closest such supermassive object. That makes it the most likely one to finally reveal the concrete evidence for a black hole that astronomers have sought for years. Shen and Lo worked with Mao-Chang Liang of Caltech, Paul Ho of the Harvard-Smithsonian Center for Astrophysics (CfA) and the Institute of Astronomy & Astrophysics of the Academia Sinica in Taiwan, and Jun-Hui Zhao of CfA. The astronomers published their findings in the November 3 issue of the scientific journal Nature.